This troupe of monkeys living in the forested areas opposite Beauty World Shopping Centre uses an overhead bridge to cross the busy road. STOMPer Chip says they are attracted by the smells of food from the nearby food centre. "I spotted this group of monkeys near Jalan Anak Bukit, opposite Beauty World Shopping Centre. 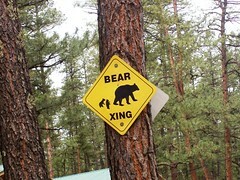 "There can be as many as 20-30 of the animals around the bus stop area, and 5-10 on the actual overhead bridge. "I believe the monkeys are drawn by the smell of food from the nearby food centre. "They leave people alone, and don't appear dangerous. 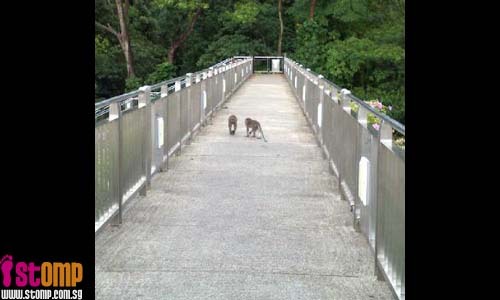 "It's really funny that the monkeys don't jaywalk, but use the overhead bridge to cross the busy road. "Even they know that traffic rules have to be followed." Looks like these long-tailed macaques (Macaca fascicularis) have figured out a safer way to cross the road. All over the world, motor vehicles take their toll on wildlife, and monkeys are no exception. Here's an example from Kenya, where a group is trying to minimise the number of Angolan colobus (Colobus angolensis) getting killed by traffic. 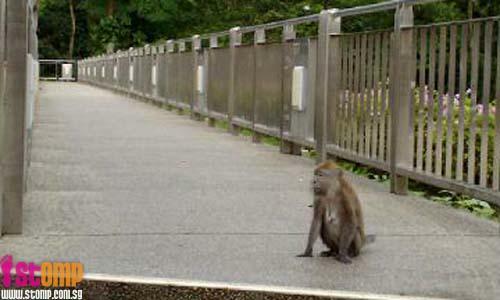 Here in Singapore, the danger comes from macaques deliberately approaching vehicles. Accustomed to being fed by irresponsible people who toss food from their cars, the monkeys dash towards moving vehicles, with some inevitable casualties. Some macaques might have learnt how to use overhead crossings, but traffic does seriously impact quite a number of other native mammals. One of the most obvious examples would be the Sunda pangolin (Manis javanica); a relatively slow-moving creature, it curls up into a ball when threatened, a strategy that offers little protection from cars. Two reports from last year of pangolins being found as roadkill can be found here and here. Two recent reports of pangolin roadkill. Another species is quite famous for its occasional run-ins with cars; the leopard cat (Prionailurus bengalensis) is an extremely rare species, and for some time, it was thought to be possibly extinct on mainland Singapore. 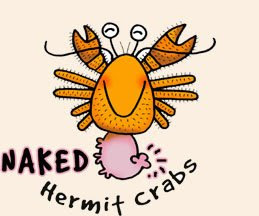 However, a roadkill specimen found along Mandai Road in 2001 proved that this species still exists in the forests of the Central Nature Reserves, while a second roadkill along Jalan Bahar in 2007 suggests that this species also lives in the Western Catchment Area. While the deaths of these animals were unnecessary and tragic, there is some comfort in the scientific value that comes with retrieving the specimen for closer study, or using the roadkill as concrete evidence for the species' continued existence as a part of our native fauna. The Mandai Road leopard cat. Snakes are another group that are very vulnerable to passing traffic; Chee Kong has recorded a number of species which have been found as roadkill, from striped kukri snake (Oligodon octolineatus) and common Malayan racer (Coelognathus flavolineatus), to banded Malayan coral snake (Calliophis intestinalis) and king cobra (Ophiophagus hannah). 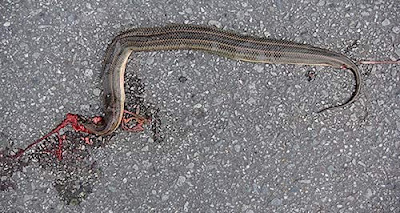 Interestingly enough, it was the discovery of a roadkill specimen that helped confirm the presence of the rainbow mud snake (Enhydris enhydris) in Singapore. Even birds are not immune; young birds that have not yet mastered the skill of flight might not be able to move out of the way in time, as shown by this mountain bulbul (Hypsipetes mcclellandii) in Malaysia, documented over at the Bird Ecology Study Group. My father once told me about the pair of squabbling Javan myna (Acridotheres javanicus) that decided to fight on the road, with predictable results. Ground-nesting birds and species that tend to fly close to the ground are especially vulnerable, with this post documenting an unfortunate incident where a lesser coucal (Centropus bengalensis) encountered a taxi. 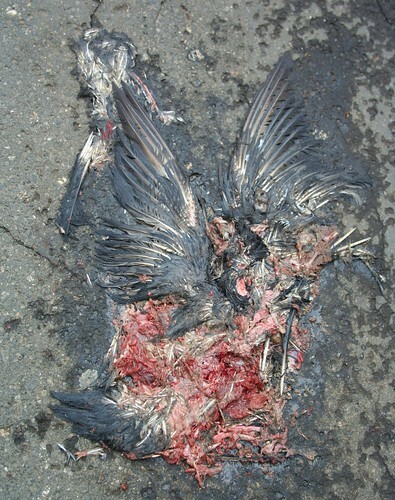 Scavengers such as crows, eagles and vultures that alight to feed on roadkill also risk becoming roadkill themselves. Here in Singapore, collisions with wildlife do not pose a great risk to human safety; if vehicular repairs are required at all, they are usually quite minor. 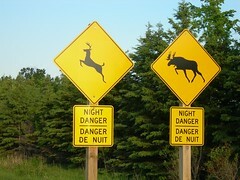 However, in many other parts of the world, drivers have to contend with animals as large as moose (Alces alces). 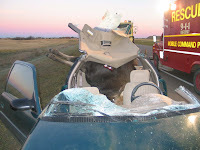 For large, long-legged animals like white-tailed deer (Odocoileus virginianus) and moose, collisions often send the animal's body launching right through the windshield upon impact, dealing substantial damage to the car and its occupants; it is said that accidents with moose are often fatal for the driver. These next few photos document one such moose-car encounter. 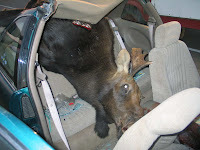 While the moose obviously did not survive, the driver was supposedly fortunate enough to escape with only a few broken ribs. Many amphibians are terrestrial, but travel relatively great distances overland in order to reach suitable breeding ponds. 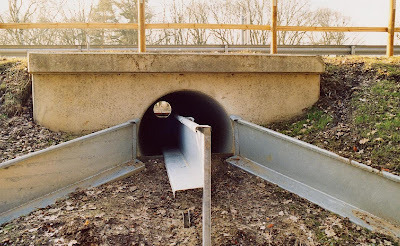 In areas where good salamander or toad habitat is now crisscrossed by a network of busy roads, this brings them into direct conflict with vehicles. 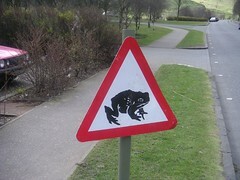 In the United Kingdom, much attention has been paid to the impact of roads on the annual migration of the common toad (Bufo bufo). Personally, I have witnessed what happened to an escaped American bullfrog (Lithobates catesbeianus) that tried to cross Neo Tiew Road. And earlier this year, I realised that the oddly-patterned smear on the road at my workplace was actually the remains of a banded bullfrog (Kaloula pulchra), after it had been run over repeatedly by passing vehicles. For some reason, I am reminded of an old game known as Frogger. Turtles are another group that are extremely vulnerable to traffic; like pangolins, their defense mechanism, which has served them so well for millions of years, is useless against the impact of several tons of metal travelling at high speed. 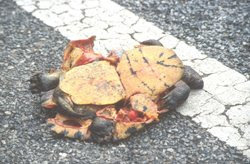 This post on STOMP shows one person's attempt to prevent an unidentified turtle from becoming roadkill. However, this site documents a tragic example of the heavy toll that busy highways can exact on wildlife, especially turtles in particular. The casualties of US Highway 27 at Lake Jackson, Florida. 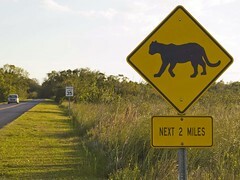 There are many ways to reduce collisions between cars and wildlife; signs warning drivers to look out for animals crossing the road do help, but of course, animals don't read warning signs. And judging from the behaviour of some people, neither do drivers. 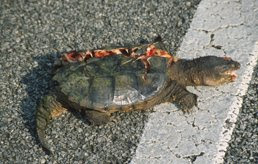 Some drivers will even deliberately swerve to run over small creatures they see crossing the road; snakes and turtles are frequent victims of such despicable behaviour. 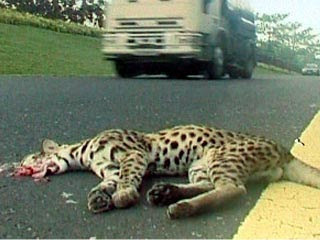 The risk of accidents with wildlife can play an important role in the planning and construction of roads. Fences and other barriers can prevent animals from accessing the road, although many animals can climb or leap over, or burrow under them. Constant maintenance is also necessary to preserve their effectiveness. 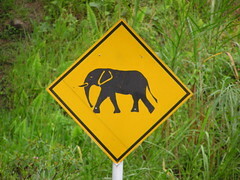 Barriers also help to guide animals along the roadside towards wildlife crossings, creating a win-win situation; vehicles can still travel unimpeded, while animals are able to cross the road safely without getting flattened. For arboreal species, simple rope bridges linking trees on both sides of the road can greatly reduce the death toll. 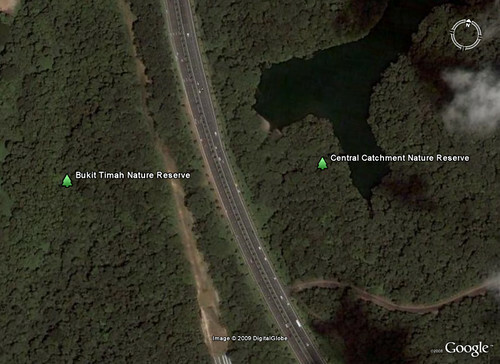 For more than two decades, the Bukit Timah Expressway (BKE) has effectively severed the Bukit Timah Nature Reserve from the Central Catchment Nature Reserve. It has formed an impassable barrier for all sorts of wildlife; not many animals dare to risk crossing the road, and even fewer make it across. Not only is wildlife prevented from moving between the two nature reserves, pollination and seed dispersal is also hampered. Here's a satellite image of the affected area, as seen on Google Earth. The Bukit Timah Nature Reserve is surrounded on three sides by development, while the BKE separates it from the Central Catchment Nature Reserve. Cut off from the much larger Central Catchment Nature Reserve by this expressway, and surrounded on all other sides by development, the Bukit Timah Nature Reserve is essentially an island, greatly increasing the risk of extinction for many species. It is thus extremely heartening to read about the possibility of building an eco-passage to enable wildlife to move freely between the two areas once more. 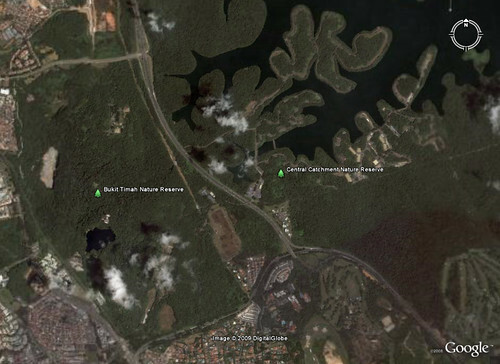 Here's a closer look at one stretch of the BKE that runs between the two nature reserves. Other measures involve rescuing and treating animals involved in collisions with traffic. 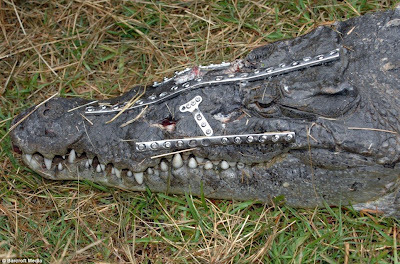 Darren Naish shared the recent example of 'Robo-Croc', the American crocodile (Crocodylus acutus) that got struck by a car and now has metal plates bolted to its head while it slowly recovers. 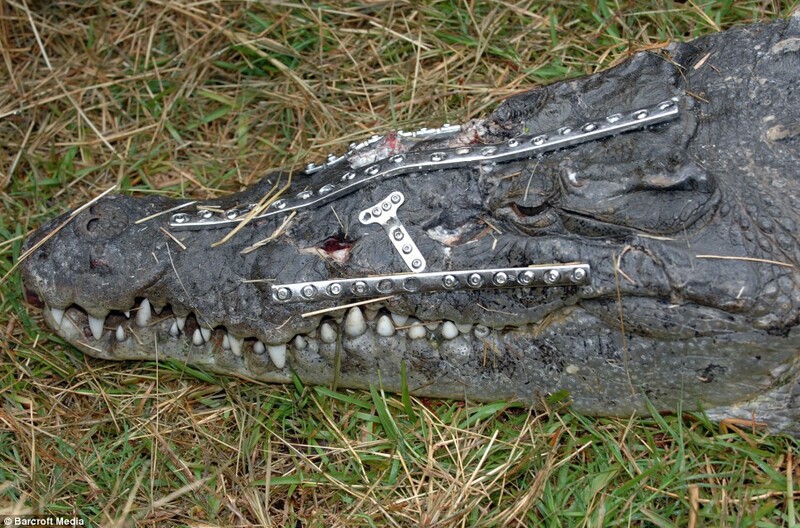 Another extremely interesting way of dealing with roadkill is seen over at Empire of the Turtle. 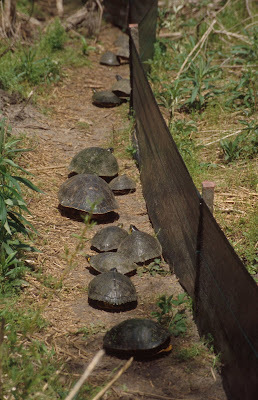 Turtles wander onto roads for various reasons; for some terrestrial species, males may be wandering around in search of females, while for semi-aquatic or aquatic species, the casualties are often females looking for suitable locations in which to lay their eggs. 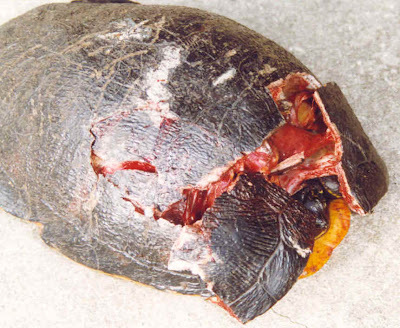 Female Florida redbelly turtle (Pseudemys nelsoni), seriously injured after being run over by a vehicle. 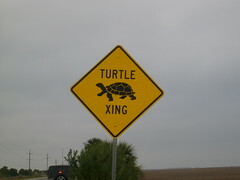 For many turtles found on the road, it is too late to do anything to save them. However, if people act quickly enough, the eggs can be saved. 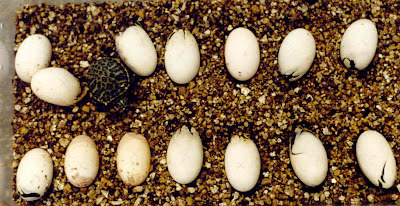 By removing any viable eggs from the fresh carcasses, incubating them, and then releasing the resulting hatchlings, people can help give a new lease of life to eggs that would have otherwise decayed together with their mother's remains. 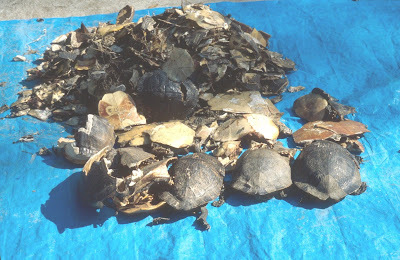 The injured turtle pictured above died, but her eggs were salvaged, and the hatchlings were subsequently released. 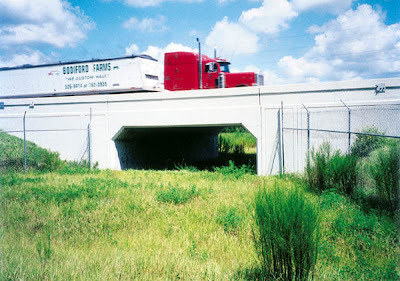 Wildlife and roads usually don't go well together, and the consequences of accidents between wildlife and traffic are often serious. 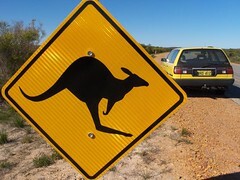 There's actually quite a lot of information on roadkill in other countries that is available via Wikipedia. 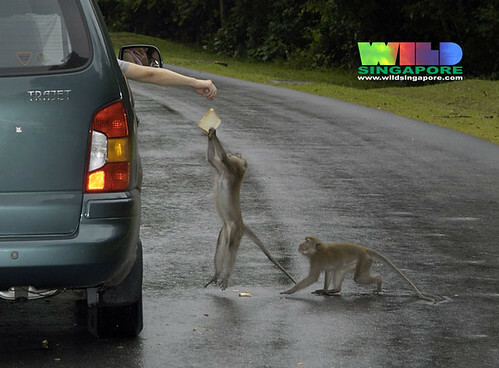 Singapore, with its extensive network of roads large and small, certainly presents a great challenge for many species. 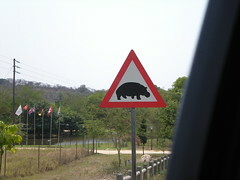 However, it is encouraging to see at least one species adapting to utilise a far safer method of crossing the road. It would definitely be desirable to find ways to help other species cross roads without running the risk of becoming roadkill. Did lightning strike this tree? Bees, bees and more bees at Clementi! Any moray eel experts out there?